Organic Studio 1.1 Free Download - A unique vector editor for easy creation and editing of rich, complex shapes. A unique vector editor for easy creation and editing of rich, complex shapes. 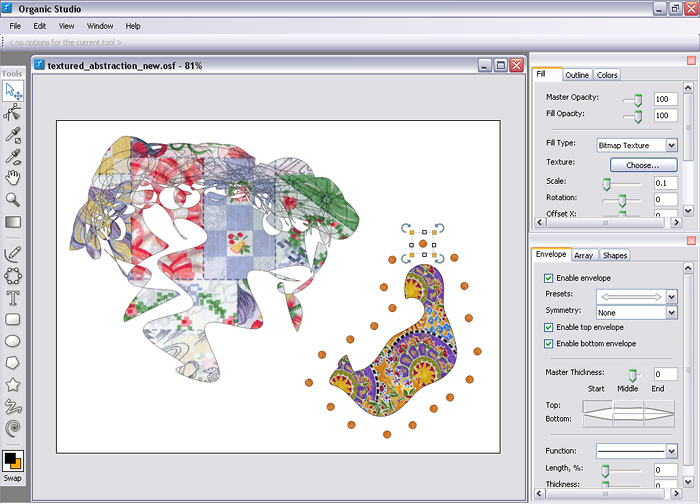 Organic Studio is a procedural vector editor which uses envelopes around simple contours to produce complex-looking shapes that are still easy to edit.It also provides a unique along-the-path instancing tool, which takes one or several shapes and places them along the outline of any object, with various adjustable settings. Shapes can be shaded with solid, gradient, or bitmap fills, and exported as AI or SVG formats or as a rendered bitmap. Statement: First, please download the orginal installation package by clicking the download link. Of course you may also download it from the publisher's website. Using Organic Studio crack, key, patch, serial number, registration code, keygen is illegal. The download file hosted at publisher website. We do not provide any download link points to Rapidshare, Hotfile, Depositfiles, Mediafire, Filefactory, etc. or obtained from file sharing programs such as Limewire, Kazaa, Imesh, Ares, BearShare, BitTorrent, WinMX etc. Software piracy is theft. If you like Organic Studio please buy it.